Poll: Should gardaí charge for policing at community events? Sports matches and concerts are one thing, but the have been criticisms of payments requested from community groups. 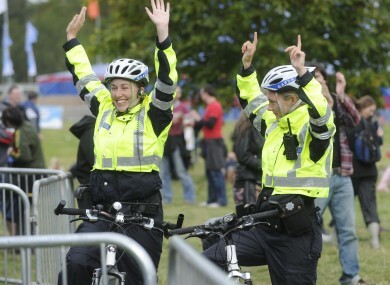 Two gardaí at Electric Picnic in 2011. THERE HAVE BEEN criticisms of An Garda Síochána after it emerged a local festival committee in Donegal was charged €4,000 by gardaí to provide security at an event. He said local community, voluntary and charity groups should not be charged as they are made up of volunteers who plan events to benefit the local areas and have to fundraise to make the events happen in the firstplace. The law allows for the Garda Commission to charge for any police services on a non-public duty basis for commercial events such as sports fixtures and concerts. We want to know what you think: Should gardaí charge for policing at community events? Email “Poll: Should gardaí charge for policing at community events? ”. Feedback on “Poll: Should gardaí charge for policing at community events? ”.